The Guildhall is a great venue for your party. 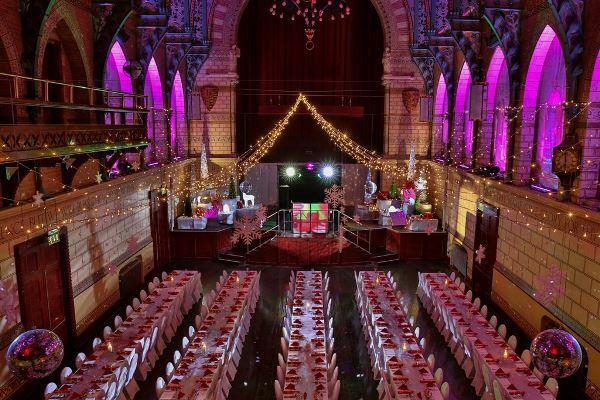 The team will be happy to assist you booking this exquisite venue which will make a stunning backdrop for your party. We also offer preferential rates for charities and voluntary groups. Click on the links below to find out more about each venue. We have catering and bar contracts in place and all food must be provided by one of the caterers on our framework and all alcohol must be provided by Phipps Brewery. We have a range of caterers who can work with you to design your perfect menu; please contact the team at the Guildhall Office for further details call 01604 838400 or email [email protected]. You are welcome to use any entertainer you wish, but we ask that they contact us at the Guildhall by email at [email protected] to discuss any limitation that might cause a problem such as, smoke machines, haze machines, confetti cannons or fireworks. You may provide your own decorations but there are certain restrictions about the items you may use as decorations. Example restrictions are that you must always use fire-retardant materials and we do not permit the use of helium balloons in the building. Other restrictions may apply depending on your requirements. We have furniture available for the function; however, if this is not satisfactory and you would prefer an alternative you will be required to hire anything that we do not have in stock. Details are available by contacting us at [email protected]. We can provide parking at the Guildhall for anyone involved in the organisation of the event; e.g. disco, caterers, table dressers etc. all other guests will need to use the public parking provided within the town centre. Cars will need to be removed from the Guildhall car park after the event has finished. Our terms and conditions stipulate that we have two fully-licensed security door supervisors for the first 50 guests and 1 more for every other 50 guests. This is a discreet and professional service and you will hardly notice they are there. Prices are available by contacting us at [email protected]. We will arrange this for you when your numbers have been confirmed. You are liable for any damage to the building or its fixtures and fittings caused as a result of the function and will be invoiced accordingly after the event. This is not a regular occurrence but all clients are informed at this stage.